Changes made in Shopventory not pushing to your point of sale? If your products aren't showing up on your POS (point of sale) system, or don't look the way you expect them to, there are a number of steps you can take to make sure everything is running as it should. 1. Check to see that the Products are Active. This is the default setting, but if your Products are inactive they won't be visible to your POS device. 2. Check to see that the proper merchant account integration is enabled. Just below the "Active" setting, you'll see the Locations field. If you see the words "No integrations," that means no integrations have been enabled for that specific Product. 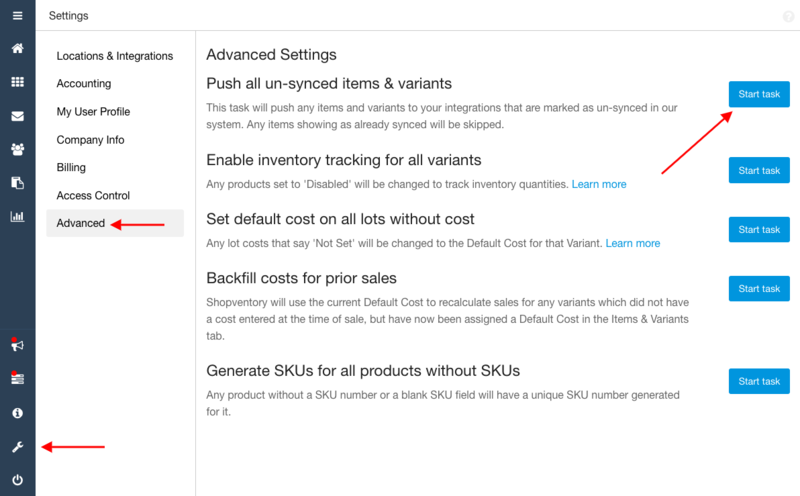 This feature allows you to enable or disable a product at a location level, for seasonal Products for example. Once you click on "No integrations at location", you'll see a popup that will allow you to enable it. Simply save your changes and your Product will be pushed to your POS. Don't forget to Save the Product after updating! 4. Give the Product a Push. Click on the product name to bring up the Edit panel, and then on the gear wheel in the top right corner. 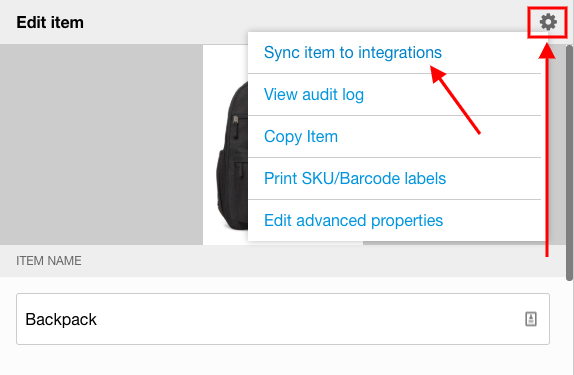 Choose "Sync Product to integrations." This will force another push from Shopventory to the integration(s) enabled for the Product. If this fixes the problem, and you find you'll need to take this step for all Products at this location, a bulk task can be triggered from the settings page. See how here. Check your register again in a couple minutes (it can take up to 10). 5. Log into your point of sale provider’s web interface to see if the Products are there. Oftentimes, Products push over from Shopventory to the point of sale provider but the Products don't go from their servers to the point of sale device itself. If you log in to your merchant account provider's website and everything looks good, it will just be a matter of waiting for your provider to update your device. It shouldn't be long now! If what you see in Shopventory doesn’t match what you’re seeing in your provider’s web portal, check the list of special cases below. It may be that Shopventory is in the process of syncing your Product(s) and just hasn't finished yet. To check, head to the Advanced tab in the Settings section of Shopventory and run the task that says " Pushing All Unsynced Products to force a sync of any unsynchronized products. You'll find this option in the 'Advanced' tab in the 'Settings' section of Shopventory. Once the process is complete, check the web dashboard for your POS again. For PayPal Here, Product names have a 60-character limit. If you have any long Product names in your account, please shorten these and try syncing again. 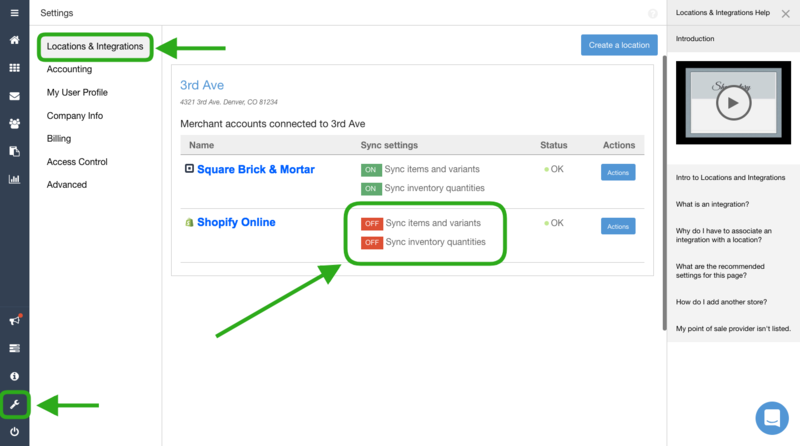 For Shopify, variants must have a price before they will sync. For Clover, if you're trying to sync a Product with variants, be sure your Clover plan supports Products with variants. Learn more here. If you’ve taken all the steps above and are still not seeing the changes you made in Shopventory on your POS provider's website, let us know! Click on the chat button in Shopventory or send us an email at help@shopventory.com!